Dawn came with quiet and a subtle beauty. Slowly the sky lightened and a weak sun rose through thin layers of cloud. There was no burst of glorious red or brilliant light but the rain had stopped and the dense low clouds had gone. This day was forecast to be a brief interlude in the run of storms that has marked the early autumn. I’d set off in the dark and rain the evening before, wanting to wake in the wilds and make the most of this day. Deep pools on the track, which in places was running with water, reminded me of how wet it had been. My headlamp, essential in the deep darkness, picked out sparkling rain drops on the trees and the grasses and the heather. Once two bright spots caught the beam. I turned to see a deer, motionless, watching me. I had a camp site in mind at the mouth of the long valley of Strath Nethy. There used to be a crude bothy here called Bynack Stables where I stayed once on a wild November night long ago. Some seven years past, after a big winter storm, I came here to find the bothy demolished by the wind and snow. Soon after the remnants were removed by the landowners, the RSPB, and all that is left now is a flat patch of grass. On this occasion I arrived to find the ground saturated and covered with puddles. Water oozed up through the grass at every step. I pitched my shelter right on the edge of the flat area, where the ground was relatively dry though bumpier than I would have liked, then crawled inside, away from the rain. Outside I could hear the River Nethy roaring past. Although I was off early the next morning clouds were already starting to build up. The patches of sunshine only lasted a few hours and were never strong. I was heading for Bynack More, that 1090 summit on the north-eastern edge of the Cairngorms that gives splendid views of the higher mountains to the south-west and is also a nice rocky hill itself. 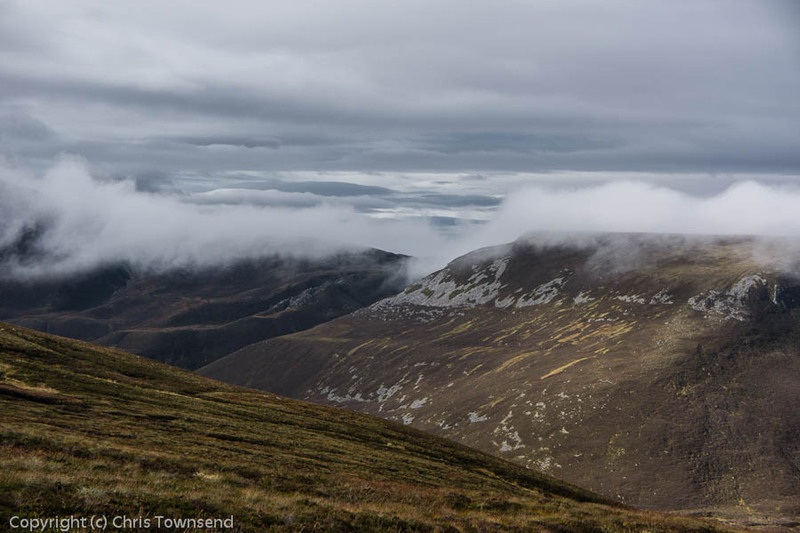 As I climbed the long north ridge I watched rolls of cloud drifting over the even longer north ridge of Cairn Gorm across Strath Nethy. 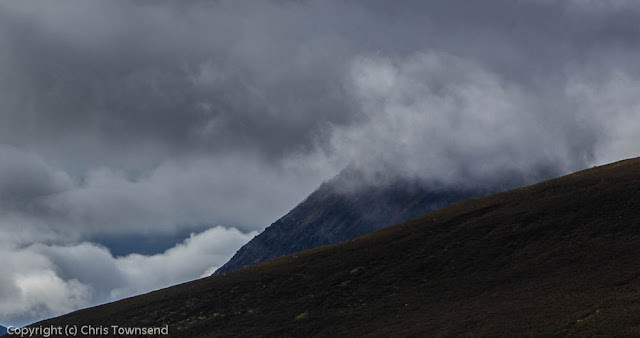 Cairn Gorm itself was buried in dark clouds, just a steep dark mountainside visible, rising to who knew what peak. Gaining height I looked back and saw that wisps of cloud were trailing across the ridge behind me, driven by an increasingly strong north-west wind. From the summit the views were curtailed as the clouds were thick and continuous over the Cairngorm Plateau. The wind was gusting strongly now and much colder, bringing with it stabs and slashes of rain. 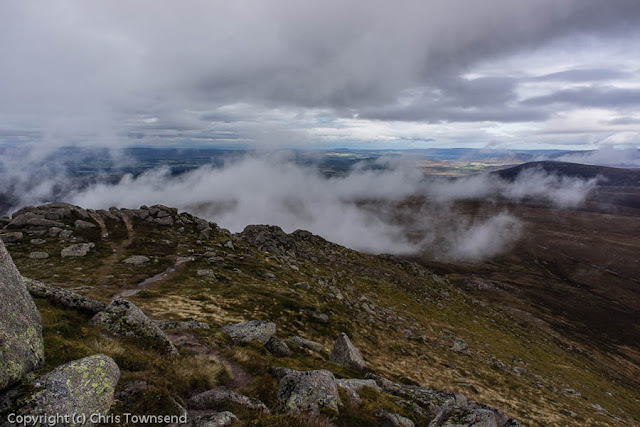 On the lower top of Bynack Beag I sheltered behind granite boulders for a snack then descended steeply into Strath Nethy, where I was out of the wind but not the now steady drizzle. 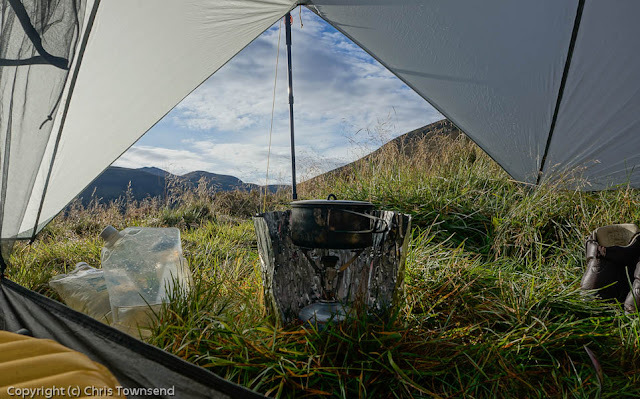 I collected the tent and walked back out to the forest and the car. The promised fair weather had shrunk to less than a day but the dawn and the clouds had made the trip worthwhile. Two questions I have wanted to ask you and your first photo above reminded me. Firstly, you tend not to use an inner with your tarptents - how do you cope with the slugs, etc? Secondly, it looks like wine in those bladders? David, actually on this occasion I was using an inner, in case there were still any midges about. (There weren't). 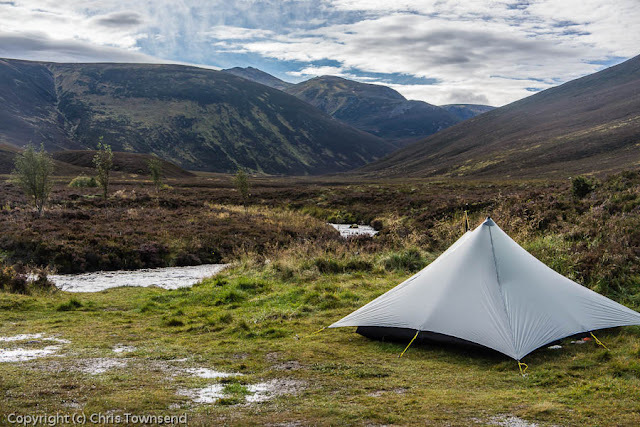 Slugs and spiders and insects occasionally wander about when I don't use an inner or when I don't close the inner doors with a tent (which I normally don't, again unless there are midges) but never enough to be any problem. As long as the creature doesn't bite I'm not bothered! David, that's not wine in the bottles! It's peat-stained water from the River Nethy. Peat does give a nice golden colour to the water. nothing wrong with the fens martin, they have a beauty all of their own!!. i am a fen tiger too. hey chris, when i did that walk in good snow a few winters ago, there was a grouse acting as a bridge guardian on the nethy bridge. he took a piece of flapjack out of my hand!!. he was either very smart, or very brave!!!. Nexus 7 - A Tablet for the Outdoors?